One of Washington DC's most famous events is the annual National Cherry Blossom Festival which celebrates the arrival of spring. 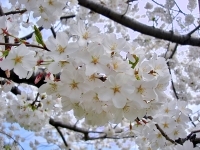 Visitors flock to the city to admire the beautiful pink and white blossoms that surround the Tidal Basin, the original gift of 3,000 cherry trees to the city from the people of Japan in 1912 as a symbol of friendship between the two countries. The festivities include a cultural blend of music, dance, art demonstrations, and performances from Japan and Washington, a fireworks display and parade. The parade is the festival's biggest event, with spectacular floats, marching bands, costumed dance groups, and giant helium balloons. A Japanese Street Festival after the parade exhibits the traditions, arts, and food of Japan. The National Cherry Blossom Festival in Washington DC claims to be the best place outside of Japan to see cherry blossoms.